The docked space shuttle Endeavour is featured in this image photographed by an STS-134 crew member onboard the International Space Station on May 21, 2011 during flight Day 6 activities. Earth's horizon and the blackness of space provide the backdrop for the scene. This story was updated at 1:08 a.m. ET. HOUSTON – The astronauts on NASA's shuttle Endeavour are more than halfway through their mission to the International Space Station, but there's still plenty of work to be done before they head home. 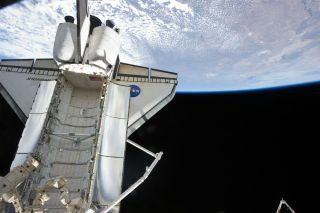 Case in point: The astronauts took one last look at Endeavour's heat shield to be sure it was not dinged while in orbit. For this final inspection, Endeavour's astronauts once again used the shuttle's 50-foot (15 meter) Orbital Boom Sensor System (OBSS), which is a long pole with cameras and laser sensors attached. Since this is Endeavour's final mission before being retired, the inspection pole — which normally returns to Earth with the shuttle — will be left at the space station for use as an extension of the outpost's own robotic arm. NASA has kept a close eye on the health of space shuttles' heat shields since the 2003 shuttle Columbia disaster that killed seven astronauts. Since then, astronauts on every shuttle mission inspect their vehicle's heat shield several times to make sure the spacecraft is in good health. Endeavour has a minor gouge on its belly and the shuttle astronauts took a second look at it last week to make sure it didn't pose a safety risk. Last Saturday (May 21), Mission Control declared Endeavour fit for landing. After their shuttle survey today, Endeavour's crew will round out the day with a string of live media interviews, including a news conference with the space station crew, which is scheduled to begin at 5:42 a.m. EDT (0942 GMT). Fincke and Chamitoff will remain in the airlock overnight, where they will don masks to breathe in pure oxygen prior to going to sleep. The hatch to the Quest airlock will be closed and the pressure in the compartment will be lowered to help purge nitrogen from the spacewalkers' bloodstreams. This helps their bodies adjust for the spacewalk, and also makes them less susceptible to suffering from decompression sickness, which is know in common vernacular as "the bends."